I knew it wouldn’t be a very nice trip. The TA map of Southland has a Schrodinger’s cat version of a trail for the bulk of this section. Little dots where it will be in theory, but these dots aren’t connected by the colour for a completed track or the colour for an unformed track. I knew it wasn’t formed, because the few other people I know who have done this section have done it on the marked detour – State Highway One. They all hated it. And why wouldn’t they? 20+ kms of hard, hard road, with no amenities of any kind and nothing interesting to see. On the bright side, I figure that I got the worst over first. It didn’t start off that bad, because the first little bit didn’t start on the road. After being set down at Stirling Point, the official beginning/end of TA, and getting a photo of the famous signpost, I spent 45 minutes walking Foveaux Walkway, a pleasant little trail suitable for all ages. It rained, but I had my waterproofs on so it wasn’t too bad. Then I hit it. The Ocean Beach pathway, leading to SH1. A barely there trail, with yellow topped posts scattered at long-distant intervals to let you know you’re going the right way. At times I could barely see one post from another, but I managed. The trail (a term I use loosely) was rocky, muddy, wet, and steep. And by this time it was hailing. But I was dressed appropriately, and wasn’t cold. The hail bounced harmlessly off. I theorised that the reason for this trail was simple. If one was very lucky, and was stumbling along in rain and hail and wind (let’s not forget the gale force wind), muddy and having to clutch at gorse to stay upright, then the upcoming nightmare of SH1 becomes something to look forward to. I’d been dreading that highway, but by this time I was positively delighted with the idea of it. As no doubt planned by the cunning minds at TA, once I stumbled onto sH1 I was positively drooling with gratitude to see it. That lasted for about 10 kms or so. It was every bit as dreadful as I feared – it just took me longer to realise it, not being in the Dead Marshes and all, and anyway the rain had stopped. The fact that the wind – still gale force – had only two directions (straight on, trying to blow me back to Bluff, or from the west, into the path of an oncoming lorry) was an aiding factor in my realisation. And the road might have gone ever on and on for Bilbo, but he was going to Rivendell and, well, with the best will in the world Invercargill just doesn’t compare, so I stopped singing that after a very short while, and moved on to Tiki Taane, in an effort to get my mind off things. On I stumbled, hour after endless hour, refusing lifts from concerned citizens with a cheerily demented “I’m doing the trail!”. Then several kms out of Invercargill, and having just passed a petting zoo, disaster struck. It begain hailing again – really hailing, much harder than on the Ocean Beach cliffside. I was in waterproofs and more layers than a Russian Matrushka doll, but it still hurt like hell. Some of them even managed to draw blood from the few exposed pieces of skin I had left. Then I took another step and the enormous blister I’d felt forming under my big toe burst. At this point arrived my knight in shining armour. A good Southern Man, in a beat-up car liberally sprinkled with empty Speights cans, Alan pulled up and asked if I wanted a lift into town. It took approximately 0.007th of a millisecond before I decided that cheating was allowable under the circumstances and threw myself into his car. Alan, it turns out, was a little under the weather himself – he’d caught a cold a few days earlier cheering on Southland against Canterbury at the Ranfurly Shield match. I’d seen the parade in Invercargill when the Stags were (miracle of miracles!) victorious. So I like to think he knew how I felt. It was only after he dropped me back at the Tuatara that I got a look at myself. (The strange looks I was getting from others should have been a clue, but I was too exhausted to care). But once I brushed my hair into less of a fright and wiped the blood off my face, I decided: tomorrow would be a rest day. 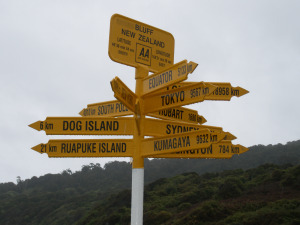 And as for those other poor souls thinking of doing Te Araroa… all I can say is that until the Schrodinger’s Cat trail decides whether or not it exists, start or end your trip in Invercargill. 20+ kms on SH1 is in no way worth it, and there’s no guarantee that Alan will be there to save you. 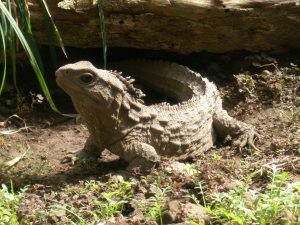 On the bright side, the stopover did give me time to see Henry, Invercargill Museum’s most famous tuatara.